Enamoured of the work of Jean Pierre Marie Persoit from the beginning of my interest in bows, I was soon hooked on the mystery surrounding this great maker when I began researching the classic French bow makers. On one of my early days at the Archives de Paris in the 1970s, I found the proper spelling of his surname, which ends in a ‘T’, not the ‘S’ often assigned it. The misspelling was encouraged by his puzzling brand-stamp, ‘P R S’. A few years later the bow maker François Malo made sense of this enigma: the larger space between the P and the R than the R and the S suggested that the crafty Persoit had simply filed out the A and I from a PARIS brand! Certain rather minimalist features run through many Persoit bows, giving them an austere feel. We also see on occasion a new idea regarding metal working, for example the addition of a brass reinforcement in the frog mortice. This, as we shall see, is important in linking Persoit to J.B. Vuillaume, who, oral tradition supposes, employed Persoit from 1823 to 1841. Initially I was skeptical of this, as the lack of bows made definitively for Vuillaume by Persoit seemed to belie the connection. Finally a bow to fill this gap surfaced, then another. But still perplexing was how he could have spent perhaps 18 years with Vuillaume, yet almost no Persoit bows from this period are to be seen. My research continued and a most enlightening document from the Justice of the Peace series at the Archives de Paris almost certainly answers this question. Dated 8 and 12 March 1816, the document describes Persoit as a ‘mechanician’ – someone involved in the creation or repair of machines, but who also might be an engineer, even an inventor. The document shows that a seemingly domestic issue was the cause of an action brought against Persoit by his brother-in-law for the very substantial sum of 800 francs – the suit won entirely by Persoit. Importantly, this at least one-time or part-time occupation suggests Persoit’s probable involvement in the creation and production of J.B. Vuillaume’s self-hairing bows and the less successful metal bows, particularly given that various members of Persoit’s family were involved in different types of metal work. Apropos of this archival discovery, the holy grail of bows has now appeared, having recently moved from a collection in France, where its owner had imagined it a Dominique Peccatte, to a collection in the US. It’s a Persoit self-hairing violin bow made for J.B. Vuillaume and bears both the ‘Vuillaume á Paris’ and the ‘Breveté d’Invention’ brand-stamps. This is only the second Persoit bow of this type that I have seen, the other one lacking its original frog. The presence of the breveté brand suggests the bow was made during the 1836–41 period, when Vuillaume held this patent. The immaculate condition of the bow presents a rare chance to examine the features demanded by Vuillaume and at the same time the stylistic intentions and some working mannerisms integral to the work of Persoit. The head bears a small round hole just above the head-plate where the player would insert the pre-made hair ribbon (the original clip for insertable hair is also there) then attach into the tightening mechanism in the frog. The head is quite fat, as is common for self-hairing bows perhaps to compensate for the possible weakening effect of the hole. Although these self-hairing bows are not always revealing as to their makers, the head mortice of this one is unmistakably Persoit in style. The frog, similarly bulbous to accommodate the inner tightening mechanism, also has a quite Persoit-like throat, small and tight. It seems logical that the metal ‘tightener’ would have been made in some foundry – perhaps by one of Persoit’s metal-working relatives – and not in the Vuillaume shop. 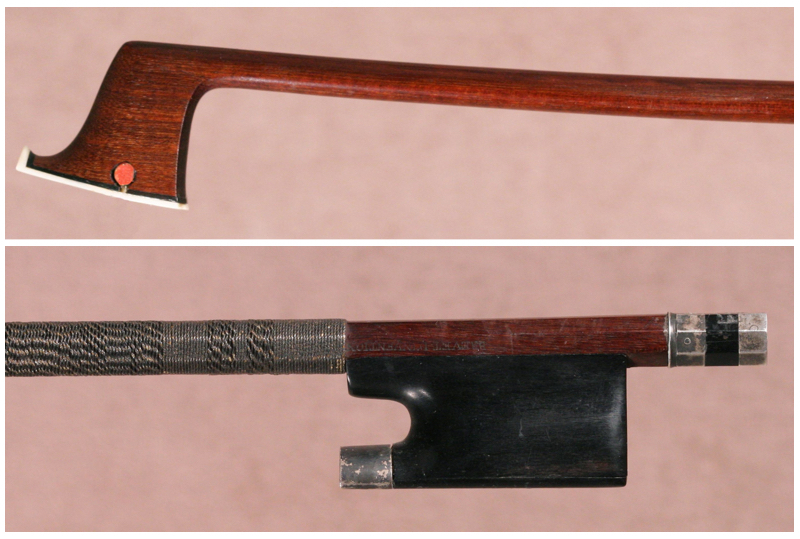 The handle mortice is typical of Vuillaume bows of this type: quite long and cut near the end of the stick. The mortice itself is undercut at its ends in the manner of François Tourte, as is sometimes seen with Persoit bows. The button is more generic J.B. Vuillaume and, although certainly original, shows us nothing of Persoit’s usual style. Returning to the head, we find a most individual and distinctive hatchet model. It is quite broad and has a rather gentle Tourte ‘bump’ in profile, rather high up toward the crown of the head. (Alhough we are unsure if Tourte intended these beautiful ‘imperfections’, it seems that other makers were following Tourte when sculpting their own heads with this feature.) The chamfers give us little to further our Persoit attribution, though they are more reminiscent of Persoit than of any other bow maker who worked for Vuillaume. The throat, moving from the head into the stick is quite unusual – we see a creative gesture on the part of Persoit, which was certainly not an imperative of Vuillaume. The stick, of a dense and attractive dark red-brown pernambuco, is very robust immediately beyond the head and is remarkably triangular in its upper section, changing to dimensions wider than tall in the lower section. This magnificent bow, which retains its original wrapping, weighs 56.4 grams without hair and has a length of 72.9 centimetres. It confirms a most important connection between the great maker Persoit and the equally great luthier-entrepreneur J.B. Vuillaume. An expert in French classical bow making, Paul Childs is author of ‘Jean Pierre Marie Persoit: His Life and Work’ among other publications.